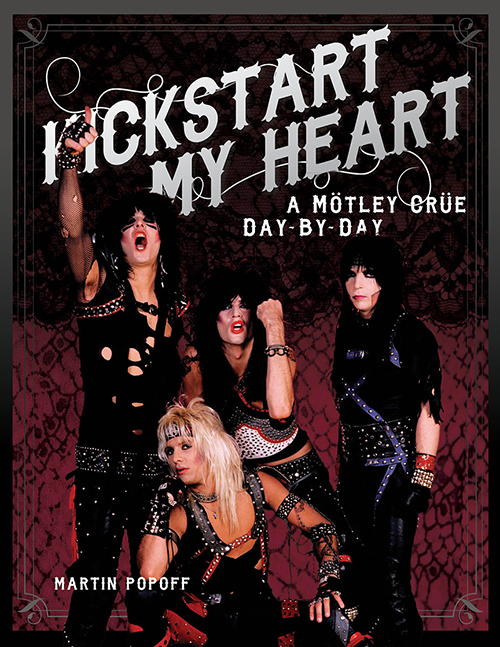 Kickstart My Heart: A Mötley Crüe Day-by-Day is an exciting chronology that celebrates in innovative form – through the use of day-by-day entries and supporting band quotes mostly collected firsthand by the author, as well as memorabilia shots and photography – the crazy lives lived by Vince, Mick, Nikki, and Tommy at the booze-drenched apex of the rock-'n'-roll food chain. Augmented with entries that help place the band in a wider rock context, Popoff presents a swift-moving, action-packed symphony of text and visuals that reprises his collaboration with Backbeat on similarly structured titles about Iron Maiden and Ozzy Osbourne. With very few Mötley Crüe-related books on the market, Kickstart My Heart will likely serve for years to come as the most complete – and completely party-hardy – celebration of this band now 35 years on and in the midst of completing its final tour ever.